It’s the time of year when we reveal our plans for next season! Our programme of main concerts for the 2018-19 season is described in the brochure included with this newsletter and on the Havant Orchestras website. We are continuing our usual scheme of three main concerts by each orchestra, with Havant Chamber Orchestra continuing at the convenient location of Ferneham Hall, Fareham, and the larger Havant Symphony Orchestra performing in the excellent hall at Oaklands School, Waterlooville. 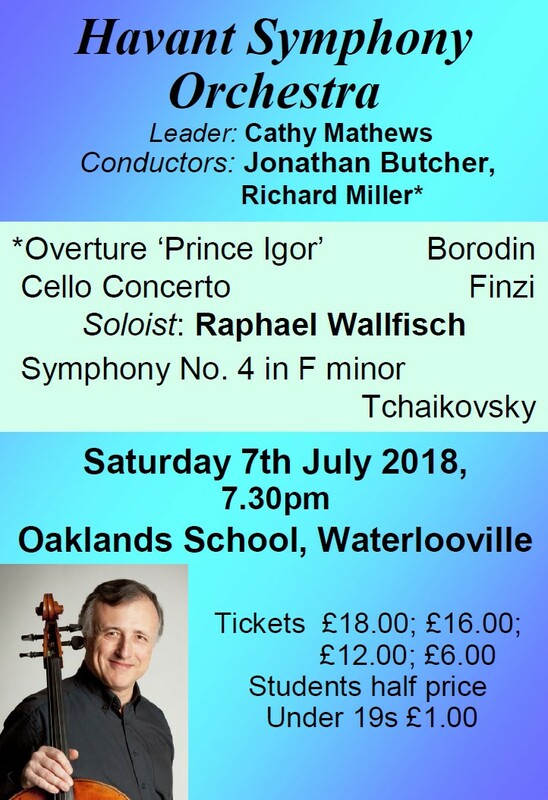 Season tickets booked before the 7th July HSO concert at Oaklands can be collected at that concert, otherwise please enclose an SAE so that the Tickets Secretary can post them to you. Tickets for individual concerts normally become available about two months before each concert, but for the first concert in October booking does not usually open until around mid-September in order to allow preferred seats to be allocated for season tickets. (Season tickets will still be available after that date, but the seating choice may be more limited). 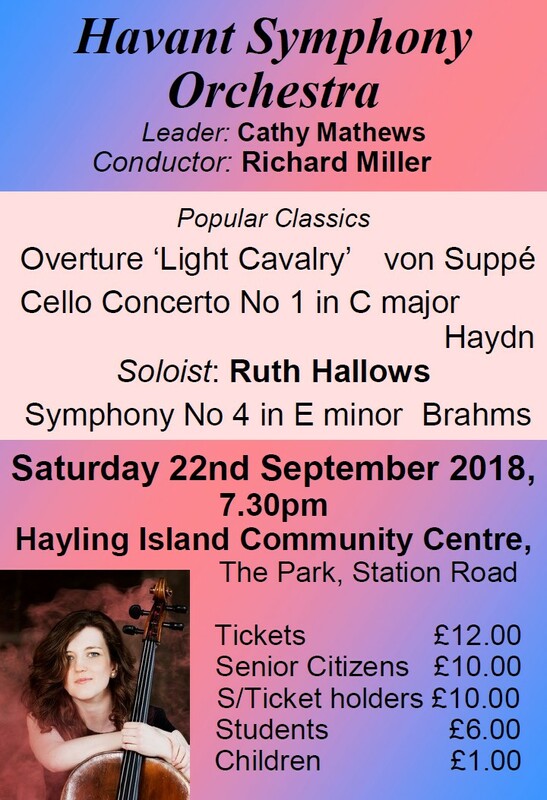 In addition to the six main concerts described in the brochure, HSO has its usual “Popular Classics” pre-season concert at Hayling Island Community Centre on Saturday 22nd September, selected and conducted by our current Bob Harding Bursary award holder, Richard Miller. This year’s programme, described on the back page, features cello soloist Ruth Hallows playing the Haydn C major concerto. 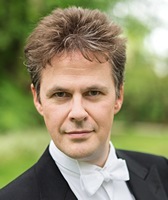 Details of how to obtain tickets will be made available shortly before the July concert. Meanwhile, we are looking forward to our concert on Saturday, with brilliant violin soloist Rose Hsien, who will also be giving the pre-concert talk at 6.30pm. There are not many opportunities to see live orchestral classical music in this area, so please make the most of it and bring along lots of friends to share the experience! Our soloist Rose Hsien will be talking about the violin works. The pre-concert interlude in the Octagon Lounge will be given by students from Meoncross School, under the direction of Paula Barnes. Pop in to the lounge to listen to these talented youngsters, who appreciate the opportunity to perform in front of a friendly audience. I’m writing this piece over the bank holiday weekend, enjoying the gorgeous sun. Both are equally rare: the bank holiday sun, and my schedule allowing a sufficiently long enough break from conducting and travelling to enjoy it. This weather brings to mind the sunny, spring-like nature of the next HCO programme: Dvorak and Mozart, both at their best here - fresh, uplifting and spirited. I always particularly love programmes that exhibit a coherent balance, shape and overall connectivity, as this one does. Full of symmetry, and both musical and geographical cross-connections, it appeals on so many levels. And, quite apart from anything else, it’s always enchanting to get a “double-dose” from such a wonderful soloist, especially in such contrasting works. Rosie Hsien and I first met over a pert and articulate Mozart No 4 a few seasons ago. I was immediately struck by her dazzling technique, clarity of both tone and thought, and engaging personality on stage. Coming from such a tiny frame, her sound fills the hall, and her tone in turn smiling, or melancholic, as befits Mozart or Dvorak. I’m certain you'll find her as breathtaking as I have done when I’ve shared the stage with her. The Mozart concerto has always been one of my favourites, being perhaps the first proper concerto I learned, and later performed, as a young violinist at the start of my career. The young Wolfgang packs so much into it: from the wide sweep of the opening movement, through a central adagio of almost unbearable beauty and restraint, into a rondo finale filled with invention, and nearly improvisation. The Mozart/Czech theme continues with Dvorak’s Romance, one of the highlights of the shorter solo repertory, and the same composer’s Czech Suite, full of some singularly Bohemian signatures: buoyant, articulated rhythms, long-flowing cantabile lines and a real joy of life - even when in a minor key. Touches of melancholy, yes - as Dvorak could do so well - but always eventually turning to a smile, if not even a grin. And we end in Prague, although not in Dvorak's time, but that of Mozart: one of the most perfectly-formed of all Mozart symphonies. Opening with one of the most intricate slow introductions of its time, it eventually yields a first movement of real depth and virtuosity. Some scholars even contest that the slow movement contains the kernel of Edward Elgar’s famous, yet eternally veiled, Enigma theme. If you listen carefully, you can spot it nested in the codetta of each half. Mozart, Dvorak and Prague. What can be better for spring? Plus it’s such a wonderful coda to our season. Thank you all for your support throughout the year and I look forward to sharing music with you again next year. See also the ‘Music in Portsmouth’ website www.musicinportsmouth.co.uk for listings of amateur instrumental and choral concerts in the Portsmouth area.